Victoria Beckham is out in New York working on a shoot with Reebok and yesterday(November 28th) she was spotted leaving her hotel in the city. 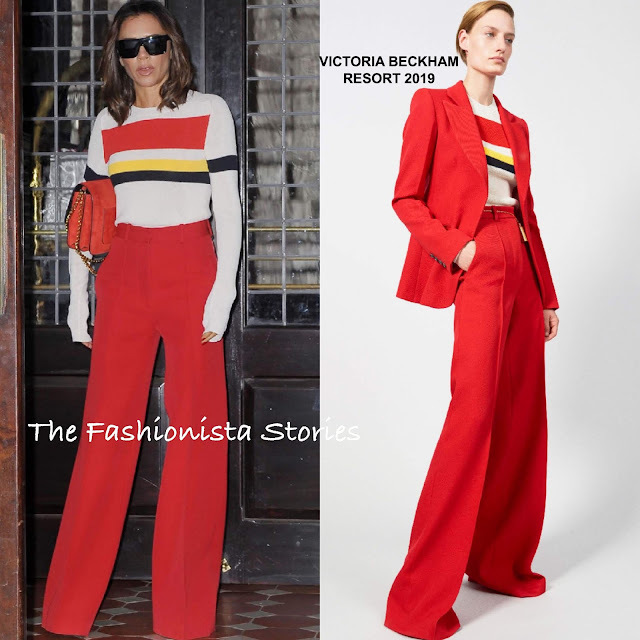 Working chic look from her namesake collection, she wore a RESORT 2019 white striped, ribbed panel top and vibrant red, wide-leg trousers. Thankfully she didn't wear the trousers as presented and had them hemmed. I really like this, it's the perfect fall look. She topped off her look with dark sunglasses and a red bag which is probably from her collection as well. Are you feeling VB's look as well?